tBDW is a scriptable interface for Project Dogwaffle, a painting and animation tool by Dan Ritchie. It provide an environment for experimenting with image processing algorithms, using thinBasic. thinBasic is a powerful yet easy to use scripting language by Eros Olmi. 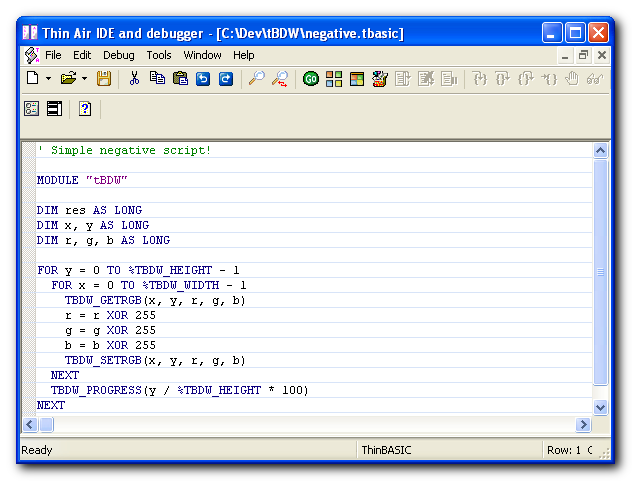 Everyone familiar with any BASIC-like syntax will found himself at home writing code in thinBasic. tBDW is derived by another project of mine, DogLua witch in turn was largely inspired by gluas, by OEyvind Kolaas. First, You need to have thinBasic installed. Then, it's just a matter of being sure that the tBDW.DLL can be found by thinBasic. The DLL can be simply put in the same folder of the script(s) to be executed, for example. If Project Dogwaffle is running, the included negative.tbasic sample should be working right away with a double click, simply after unzipping this package. The file tBDW_keywords.txt contains all the keywords currently implemented by tBDW; to get syntax hilighting in the thinAir editor, simply add its contents to the thinbasic\thinAir\Syntax\BASKeyWords.txt file. Here's a quick summary of the presently available functions. This is just a minimal initial subset and will be expanded and completed soon, but it's already more than enough to start coding something interesting. For a quick start and general info on thinBasic, instead, you may refer to thinBasic community. + API expanded: GetValue, SetValue, Flush. + First working version released!